School Yard Phase 2 is a new-build residential development of 13 homes within the grounds of a grade II listed former school building and yard in Harborne, Birmingham. EDG Property completed the first phase of the School Yard in 2013 which saw the development of historically significant buildings converted into a social hub combining restaurants, coffee shops and a food school operating as a social enterprise. The development is in Harborne, a bustling suburb located approximately 3 miles south west of Birmingham City Centre. Phase 2, the new build development, is at the rear of the building formerly known as Harborne Clock Tower which was originally built as a school in 1881. It was designed by one of Birmingham’s most celebrated architectural practices, Martin & Chamberlain and is Grade II listed. At the end of 2013 BPN Architects won the design competition for this, the £2.2m second phase of the School Yard development. Selected architects practices were invited to submit proposals for an innovative design to maximise the potential of this small site. The brief for the competition was open-ended, but the judges were won over with our proposal which is based around 2 blocks of upper floor accommodation linked by an open staircase, open timber walkways and terraces. 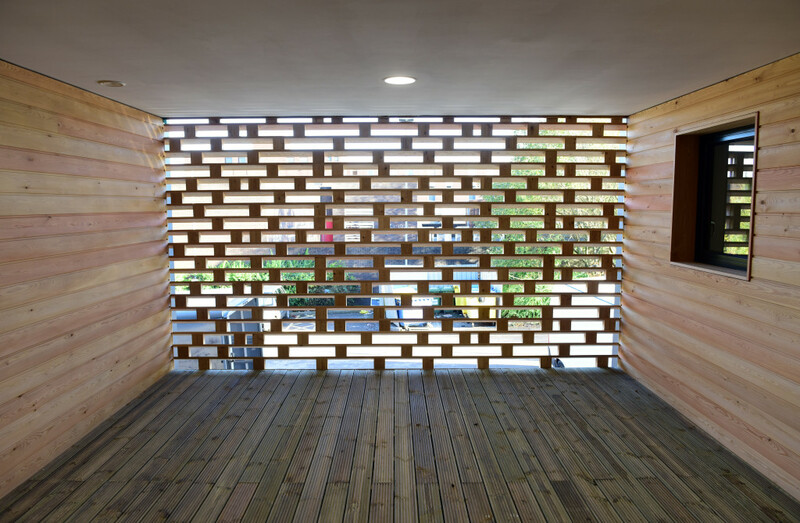 Walkway areas contain ‘cut outs’ to help natural light filter through to lower levels. 13 residential units are provided which are made up of 1 and 2 bed apartments, as well as 2 and 3 bed duplexes. Secure car parking is located at ground floor level. Structurally the building is a combination of concrete frame at ground floor, lift core, etc with the upper floors constructed in lightweight timber frame. The facing material palette is simple and contemporary, selected for inherent qualities, giving the development a distinctive and contemporary appearance. 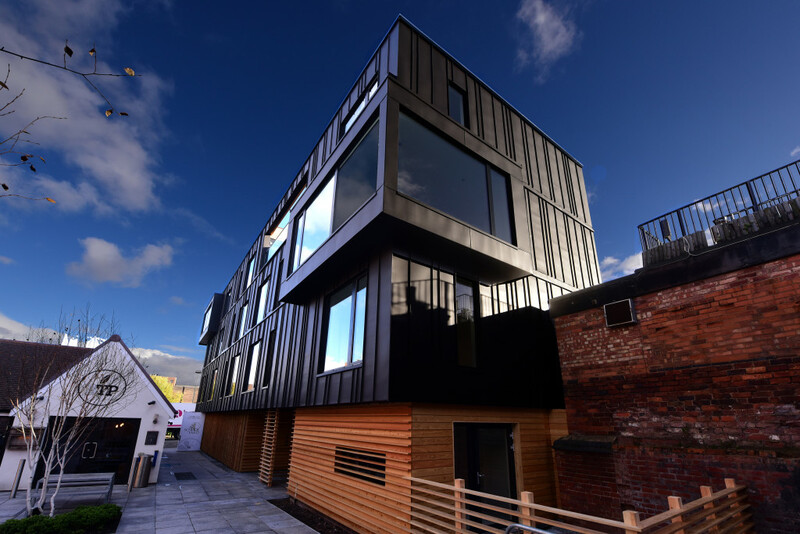 The ground floor is wrapped in Siberian larch cladding and the upper three storeys are clad in black zinc with standing seams. The random pattern of the standing seams provides visual ‘movement’ and texture to the surface of the building, which along with the irregular arrangement of the windows helps to animate the façades. Also the combination of different sizes interacts delicately with the sunlight – offering smooth light and shade variations to the elevation as the day passes. Horizontal zinc seams at each floor emphasize horizontal arrangement. 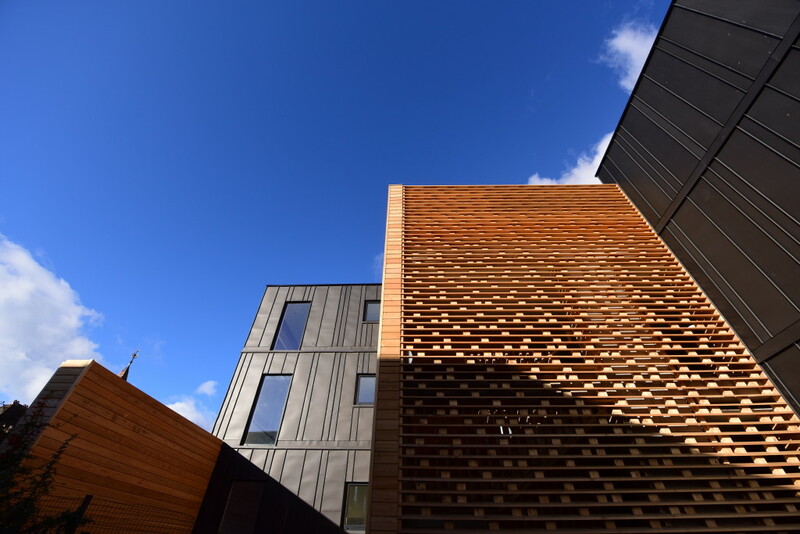 The timber cladding to ground floor integrates louvres which add interest and depth to the elevation whilst also echoing the louvres on the external walkways. 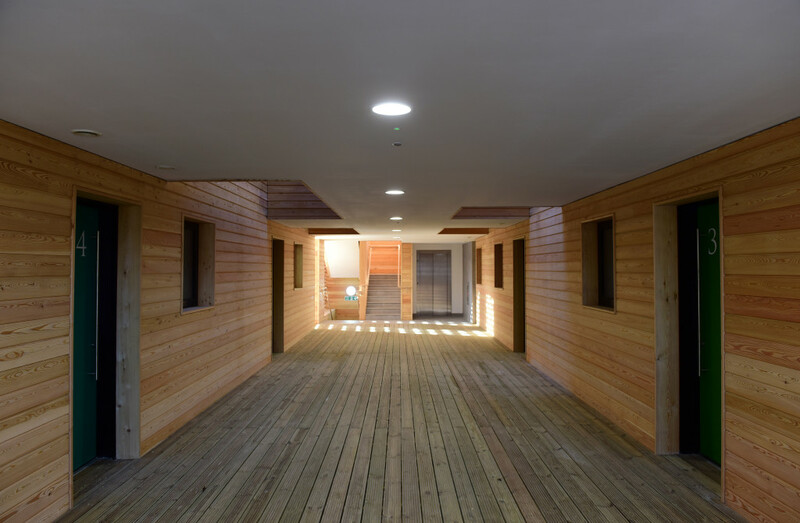 Elevations to the walkways are finished in matching timber. 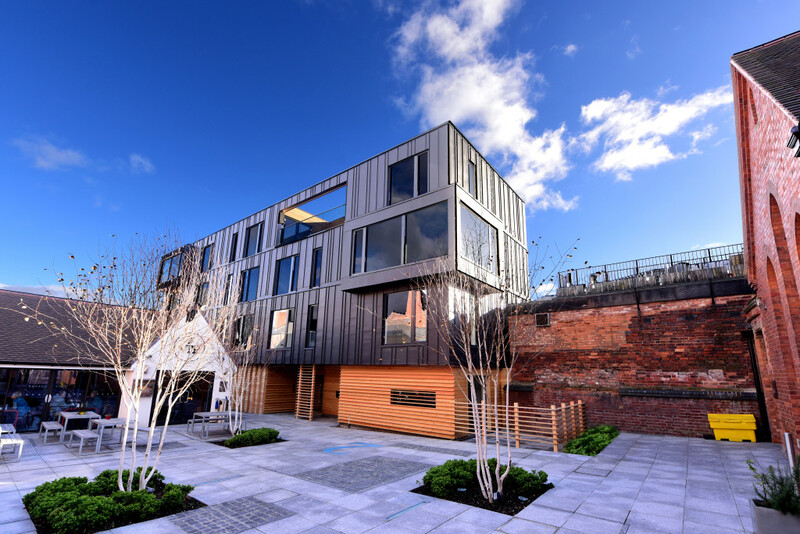 The project was completed in December 2015 and received an RIBA Regional Award in 2016, as well as winning the residential category in the 2016 RICS Awards. Video by artist Amy Lunn for BPN Architects.